Bono – Prime Minister ? ‘An inspirational speaker’… Tony Blair on Bono of U2. Photograph: Getty ImagesIn a memoir filled with profound navel-gazing, political bombshells and a few purple-prose love scenes, Tony Blair has also found time to salute U2‘s activist frontman, claiming he “could be … prime minister”. Blair’s new book, A Journey, is the hottest thing in bookshops this week. It captures the government equivalent of band in-fighting – Brown and Blair like the Gallagher brothers – and even Blair’s struggle with alcohol. But it’s also got a tiny bit of real rock stardom, particularly in a passage on Bono. On page 555 (via Spinner), Blair praises Bono as pop’s answer to Barack Obama – someone who could cross party lines and get things done. “I knew he would work with George [W Bush] well, and with none of the prissy disdain of most of his ilk,” Blair writes. 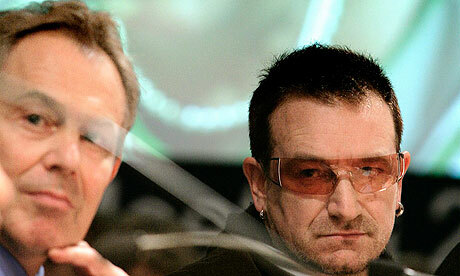 “[Bono] could have been a president or prime minister standing on his head. He had an absolutely natural gift for politicking, was great with people, very smart and an inspirational speaker … [He was] motivated by an abundant desire to keep on improving, never really content or relaxed. Celebrities, Blair explains, “can reinforce, even boost [a political] message … What they can’t do, of course, is substitute for the politics … but properly used, they help. And frankly, given the difficulty in rousing the damn thing, [Labour] needed the help.” Perhaps U2 could write a new soundtrack for Blair’s audiobook.